Most precious metals were lower Friday and for the week but only gold posted a loss for November, falling 0.4%. Despite that, November sales of U.S. Mint American Eagle gold coins more than doubled the previous month and more than tripled the same period last year, logging the best month since July 2010 and the best November since 1998. "There is a significant amount of industry selling in anticipation of higher taxes related to the fiscal cliff," Reuters quoted Frank McGhee, head precious metals trader at Integrated Brokerage Services LLC. "On the other hand, there is a fair amount of retail buying, but in this case Wall Street tends to win." On Friday, gold for February delivery fell $16.80, or 1.0%, to settle at $1,712.70 an ounce on the Comex in New York. The yellow metal was off 2.2% for the week. Last week gold rallied 2.1% and closed at its highest price since Oct. 17, thanks in large part to a Friday bounce of more than $23. "The breakout was a fake-out. Whoever bought gold last Friday as the market pushed to a five-week high realized they had a problem when there was no follow to start this week," Kitco News quoted Frank Lesh, broker and futures analyst at FuturePath Trading. "Most markets are now hostage to the fiscal cliff debate as it is now risk on or risk off at any moment and no one really knows how the situation will turn out. There is also some end-of-year profit taking and tax selling going on, but until there is more clarity on this issue, I expect gold to chop around in a range, so look for prices to be steady," added Lesh. Kitco’s weekly gold survey is bullish for gold prices next week with 18 participants seeing prices higher, 2 expecting them to fall and five neutral. 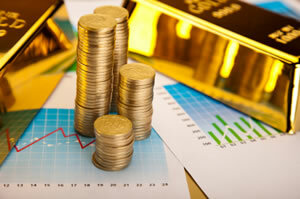 Gold has gained $145.90, or 9.3%, in 2012. It is the third best-performing precious metal, behind silver which is up 19.2% ($5.36) and platinum which is higher by 14.2% ($199.70). In the red in October, Palladium has logged a 4.9% ($32.05) increase this year after rising every week in November. March silver plunged $1.152, or 3.4%, to $33.279 an ounce. Silver dropped 2.5% for the week but gained 3.0% in November. Platinum for January delivery declined $14.90, or 0.9%, to $1,604.60 an ounce. It declined 0.8% this week but climbed 1.8% for November. Palladium was an outlier in precious metals on Friday and for the week. March palladium gained 75.0 cents, or 0.1%, to $688.20 an ounce. It advanced this week by 3.1% and soared in November by 12.9%. For the week in London, metals gaining included silver at 2.6%, platinum at 1.8% and palladium at 4.2%. Gold declined 0.5%. London precious metals advanced across the board in November. Gains were 0.4% for gold, 6.2% for silver, 2.7% for platinum and 13.0% for palladium. American Eagle gold coin sales are at 136,500 ounces, more than doubling the 59,000 ounces in October and better than tripling the 41,000 ounces in November 2011. The last month to perform better was July 2010 when sales reached 152,000 ounces. American Buffalo gold coin sales reached 16,500 ounces, which is 5,500 more than the previous month and nearly double the 8,500 sold during the same period last year. American Eagle silver coin sales hit 3,159,500, just above the 3,153,000 in October and more than twice the 1,384,000 in November 2011. America the Beautiful 5 Ounce Silver Coins are at 19,700, the second best monthly level of the year. October leads at 22,100. A breakdown of U.S. Mint bullion coin sales by type are in the tables below. Bullion coin sales above are in the number of coins sold. Total ounces may be calculated by using the weight of the coin. In related coin news, the latest weekly sales of U.S. Mint numismatic products showed strong sales for annual sets and proof American Eagle gold coins. The public realizes that this is a war between the Government, Federal Reserve, Corporations versus the true blooded patriots of America. True money is gold and silver and the public will no longer stand for the fiat monopoly base metal garbage coins in circulation. WE want OUR gold back from Fort Knox and the Federal Reserve. We want the billions of corporate profits hiding off shore. We’re free men! Sic Semper Tyrannis. The gold has been leased out and sold into the market, say many experts. It’s not coming back anytime soon. Maybe never. Hugo Chavez of Venezuela got his country’s gold back with much effort and fanfare. Why does Germany say they’ll take three years to get theirs back? Because it just isn’t there in the us vaults. It has to be bought back.